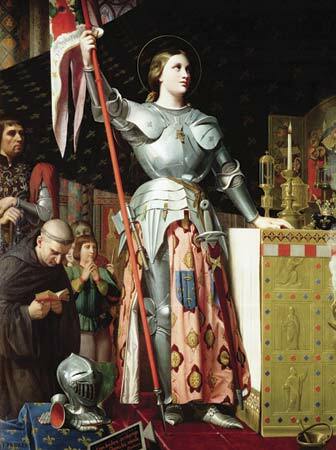 Claiming divine inspiration from God, Saint Joan of Arc, Maid of Orleans (c. 1412-1431) rallied French forces against the English during the Hundred Years' War. She was later captured by the English and burned as a witch. Religion is one of history’s most powerful forces. The quest to unravel the truth of the nature of the universe and to find the proper role of humans within it has spawned many branches of belief. Faith can be a great unifying source of peace, comfort, and understanding to its followers. Simultaneously, disagreements over matters of faith have caused some of humanity’s most terrible and destructive conflicts. We have already explored the origins and fundamental beliefs of some of the most widely-followed world religions: Hinduism, Buddhism, Confucianism, Daoism, Judaism, and Christianity. Chronologically, UNIT 3 begins with Christianity having taken root in the Late Roman Empire, and its influence having spread through much of Europe. As the military might of Rome collapsed in the West, chaos and insecurity led to feudalism and cultural stagnation. The Latin-speaking Western Roman world fused with its Germanic conquerors to form new kingdoms, such as England and France. However, even as the political power of the Roman Empire waned, the Church of Rome grew ever more powerful and influential as the Roman Catholic branch of Christianity spread through Europe. Meanwhile, in the East, the Greek-speaking remnants of the Roman Empire, known to historians as the Byzantine Empire, struggled on for another thousand years from the new capital of Constantinople, Europe’s grandest city of the Middle Ages. The last great world religion, Islam, emerged in Arabia in the seventh century AD. Its message spread quickly west across North Africa to the Atlantic, and east through Persia and India to Indonesia in the Pacific. Muslims soon found themselves engaged with Christians in a vicious contest for the Holy Land. ​Analyze the development and growth of major Eastern and Western religions. Analyze the interaction between the Islamic world and Europe and Asia in terms of increased trade, enhanced technology innovation, and an impact on scientific thought and the arts. Explain how religion influenced political power and cultural unity in various regions of Europe and Asia. Explain how religious and secular struggles for authority impacted the structure of government and society in Europe, Asia, and Africa. Analyze how innovations in agriculture, trade and business impacted the economic and social development of various medieval societies. Analyze how the desire for farmable land created conflict and impacted the physical environments of Europe and Asia. Explain how agricultural and technological improvements transformed daily life socially and economically.